IBA (Ion Beam Applications S.A., EURONEXT), a provider of proton therapy solutions for the treatment of cancer, will showcase how to secure your performance, investment, and future when establishing a proton therapy center at the 60th Annual American Society for Radiotherapy & Oncology (ASTRO) Meeting and Exhibition being held in San Antonio, Texas.Oct. 21-24. When investing in a technology that will last for over 30 years, the selection of the right partner is of critical importance. During the ASTRO meeting, proton therapy practitioners will share their experience securing, installing, and operating a proton therapy center with IBA during open sessions at the IBA booth. Proton therapy is considered one of the most advanced forms of radiation therapy. Radiation therapy professionals attending the congress will have the opportunity to discuss with the IBA team the 10 main reasons why they should offer proton therapy to their patients. With the longest experience treating patients with Proteus®ONE installation, the Shreveport, Louisiana’s Willis-Knighton Cancer Center, will showcase its results which demonstrate the clear advantages of the Proteus®ONE open gantry. The optimized workflow of the Proteus®ONE allows treatment of up to 20% more patients than other competitive systems in a record mean time of 16 minutes treatment room time per patient across a wide range of indications. Terry Wu, PhD, Chief of Physics at Willis-Knighton, will share his experience of over 500 patients treated with Proteus®ONE on the IBA booth, #2033 on Sunday, October 21st, at 2:00 PM and on Monday October 22nd, at 12:30 PM. In addition, ASTRO attendees will also have the opportunity to discuss with IBA experts and experience IBA’s latest developments in the treatment of moving tumors at the IBA booth. Beaumont Health Proton Therapy Center in Royal Oak, Michigan is a leading research center conducting advanced research in particle physics and radiation therapy. As part of its long lasting joint R&D program with IBA, Beaumont staff have been pioneers in the development of Proton Arc Therapy. Beaumont will share its first results using Proton Arc Therapy. Peyman Kabolizadeh, MD, PhD, Medical Director at Beaumont Health Proton Therapy Center will share the latest advances on Proton Arc Therapy on Tuesday, October 23rd, at 12:00 PM at IBA’s booth, #2033. IBA experts will also demonstrate online adaptive treatment and provide previews to visitors to the IBA booth on multiple research projects that are currently under development. The past five installations of the Proteus®ONE and Proteus®PLUS solutions in North America, Europe, and Asia have the first treatment room completed in less than 12 months. This allowed customers to begin providing proton therapy to their cancer patients sooner. Moreover, availability and reliability of the system allows for a fast ramp up of patients. Additionally, the open gantry design allows users to easily treat non-coplanar fields in a wide variety of indications. Consequently, Beaumont Health Cancer Center recently completed its first year of operation treating more patients than initially projected – over 100 patients in year one. Beaumont staff will share their experiences using IBA’s Proteus®ONE and the benefits of its open gantry design. Craig Stevens, MD, PhD, Chair of Radiation Oncology, Beaumont Health System, will describe his experience in adding proton therapy to the facility on Sunday, October 21st, at 12:00 PM at IBA’s booth, #2033. In addition, University of Pennsylvania, one of the earliest adopters of proton therapy with its establishment of the Roberts Proton Therapy Center, has developed and validated a model-based approach to identify patients who will benefit most from Proton Therapy. Such an approach helps identify the cancer patients who could most benefit from proton therapy. UPENN will share its model and its resulting impact on the treatment of head and neck patients. Alexander Lin, MD, Medical Director at Roberts Proton Therapy Center, will demonstrate his patient selection model on Monday, October 22nd, at 4:00 PM at IBA’s booth, #2033. IBA continues to expand its collaboration with key technology partners to further integrate its proton therapy solutions with existing radiation oncology systems and equipment. At our booth, see how this provides maximum flexibility as well as new development opportunities for new and existing customers. Earlier this year, IBA and Elekta signed an agreement to develop and offer the broadest single platform for use across all radiation treatment modalities. 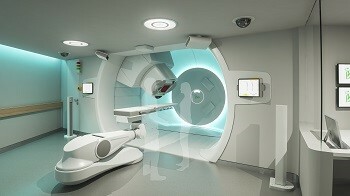 IBA and Elekta are developing new functionalities specific to proton therapy treatment in Elekta’s Monaco® treatment planning system (TPS) and enhancing MOSAIQ® Elekta’s industry-leading patient-centric oncology information system (OIS) with the goal to enable clinical pathway-driven adaptive particle therapy. This will offer a seamless experience across modalities for comprehensive radiotherapy departments and further improve patient care. IBA and RaySearch Laboratories (“RaySearch”) will present their online adaptive proton therapy workflow where daily optimized plans are created for each individual patient based on cone beam CT images to preserve the original treatment intent. Both companies are demonstrating RaySearch RayCare®, the innovative new oncology information system (OIS) designed to support comprehensive cancer care, and the RayStation workflow and treatment planning system, as well as IBA’s AdaPT Insight imaging platform and AdaPT Deliver treatment delivery. The solution automatically suggests to the care team an adapted treatment plan based on the most up-to-date patient’s anatomy. This workflow offers more accurate treatment plans as well as faster plan adaptation to the benefit of patients. Demonstrations can be booked by visiting either RaySearch's or IBA’s booth. Registration to the IBA proton therapy activities on the booth is available here. ASTRO '18: IBA showcases proton therapy developments, performance strategies. Appl Rad Oncol.